It can be easily misdiagnosed as another neurological condition, such as multiple sclerosis (MS). There is no known cure for this degenerative condition, which lasts for the remainder of the sufferer's life. Treatments are generally limited to softening symptoms, not the disease itself. The condition is irreversible. A person with this disease will usually end up needing to use a wheelchair, and eventually they will need assistance to perform daily tasks. The symptoms of the condition vary with the specific type (there are several), and with the individual patient. Generally, a sufferer retains full mental capacity while they progressively lose physical control over their body until their death. One means of identifying the disease is with an MRI to view the brain. 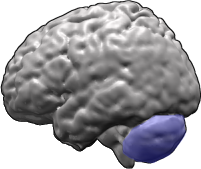 Once the disease has progressed sufficiently, the cerebellum (a part of the brain) can be seen to have visibly shrunk. The most precise means of identifying SCA, including the specific type, is through DNA analysis. Some, but far from all, types of SCA may be inherited, so a DNA test may be done on the children of a sufferer, to see if they are at risk of developing the condition. SCA is related to olivopontocerebellar atrophy (OPCA); SCA types 1, 2, and 7 are also types of OPCA. However, not all types of OPCA are types of SCA, and vice versa. This overlapping classification system is both confusing and controversial to some in this field. The following is a list of some, not all, types of Spinocerebellar ataxia. The first ataxia gene was identified in 1993 for a dominantly inherited type. It was called â€œSpinocerebellar ataxia type 1" (SCA1). Subsequently, as additional dominant genes were found they were called SCA2, SCA3, etc. Usually, the "type" number of "SCA" refers to the order in which the gene was found. At this time, there are at least 22 different gene mutations which have been found (not all listed). Identifying the different types of SCA now requires knowledge of the normal genetic code, and faults in this code, which are contained in a person's DNA (Deoxyribonucleic acid). The "CAG" mentioned below is one of many three-letter sequences that makes up the genetic code, this specific one coding the aminoacid glutamine. Thus, those ataxias with poly CAG expansions, along with several other neurodegenerative diseases resulting from a poly CAG expansion, are referred to as polyglutamine diseases. Both onset of initial symptoms and duration of disease can be subject to variation. If the disease is caused by a polyglutamine trinucleotide repeat CAG expansion, a longer expansion will lead to an earlier onset and a more radical progression of clinical symptoms, resulting in earlier death.